Yes, it’s The Zombies, but no no no, no, no, no, it’s not from last Friday night’s show in Hamden; this is from June 16 in Rockville, Md. 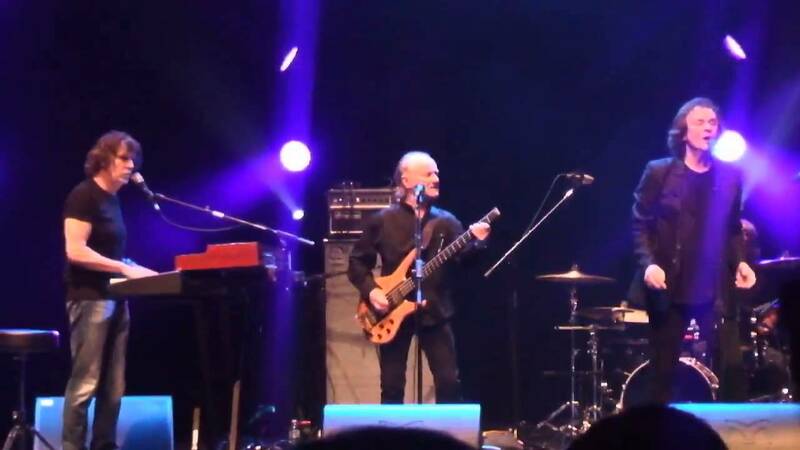 From left: Rod Argent, Jim Rodford and Colin Blunstone. From YouTube. Franorama 2.0 airs live from 10 a.m.-1 p.m. EDT (9-noon CDT, 7-10 a.m. PDT, 2-5 p.m. GMT) on Cygnus Radio, and in perpetuity in the archives. To go to the archives, click here. Finally, in this, my first summer home from my eight-year exile in California, I went to a show. And it was, indeed, a show. This year, the commission opened its four-Fridays-in-July series with The Zombies. I’d heard good things from discerning musical friends about the reconstituted Zombies — maybe the most understated and underappreciated act of the British Invasion — since singer Colin Blunstone and keyboardist Rod Argent began touring under that name again in the early 2000s. But I’d never had the chance to see them. My friend Theresa and her hubby, Fred, picked me up (thanks again! ), and we made a night of it. And for such a skeevy, sticky summer day, it was a gorgeous evening. And The Zombies were well worth it. A packed hour and a half as it got dark — all the hits, five tunes from Odessey and Oracle, some newer stuff, Rod playing “Hold Your Head Up,” “She’s Not There” to end the set, then “Just out of Reach” and “Summertime” to end it. And Blunstone — who, like Argent, just turned 68 — was in most excellent voice. All these years, I’ve seen so many performers cut corners to compensate for the vocal ranges they’ve lost. He still has his. The only other singer I can think of who kept his voice well into his 60s like that was Ronnie Dio (who lived to 67; his stomach may have failed him, but not his larynx). Anyway, I celebrated in advance by playing a half-hour of Zombies on the show that morning, a 10-song set. Musicians, get played here! A wonderful thing happened in the midst of the opening set. The irrepressible Palmyra Delran — onetime guitarist and leader of The Friggs — messaged me on Facebook with links to her two most recent singles, “Shy Boy” and “You’re My Brian Jones.” My unofficial motto is “If I like it, I’ll play it” — so I processed both cuts and got them on before the set was over. The moral of the story: If you have an album (CD or files) you think is worthy of playing, well, as I said, if I like it, I’ll play it! message me here or on my Facebook page, and I’ll let you know where to send the album. 50 years? Really? According to the FB page for the documentary The Wrecking Crew, Friday was the 50th anniversary of the day the famed group of L.A. studio musicians laid down the tracks for “By My Baby” at Gold Star Studios. Brian Wilson’s all-time favorite single and source of production inspiration. History. Anyway, that’s enough for now. Coming up this Friday: A special rave-up with the band that’s headlining before and after the fireworks Saturday evening at the Sailfest in New London — my faves, The Fleshtones. Get ready for three hours of wildness.